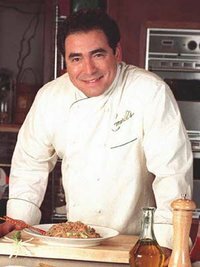 Emeril John Lagasse (born October 15, 1959 in Fall River, Massachusetts) is a celebrity chef, restaurateur, television personality, and writer. He is of French Canadian and Portuguese ancestry. He is a 1978 graduate of the Johnson & Wales University culinary program. Emeril is most well-known for his TV show Emeril Live on the Food Network, one of its highest-rated programs. Lagasse was the first host chef of Food Network's beginners' cooking show, How to Boil Water, in 1993. After several appearances on several other FoodTV programs, he hosted his own show, The Essence of Emeril. "Essence" in the title refers to the name of a spice blend of his own concoction that he sometimes uses in his cooking. Emeril also often suggested that viewers of his show create their own spice blends that reflect their personal tastes and be unafraid to use them to customize the dishes he would teach. Emeril is known for his light and jovial hosting style as well as several catchphrases, including "BAM! ", "Kick it up a notch", "Feel the love", and "Oh yeah, babe", usually said before or after adding something spicy to a dish, or after the reaction to adding something (respectively). When frying or making dishes like sausage, Emeril advocates using genuine lard, boasting "Pork fat rules!" Lagasse initially gained fame in the culinary world as Executive Chef of Commander's Palace. After leaving Commander's he opened his first restaurant, Emeril's, in New Orleans, Louisiana, in 1990. It was designated "Restaurant of the Year" in Esquire magazine of that year. Emeril is mainly known for his emphasis on Creole and Cajun cooking styles. Indeed, many of his restaurants as well as his corporate office, Emeril's Homebase, are located in New Orleans. Lagasse is the executive chef and proprietor of nine restaurants. Emeril has written several best-selling cookbooks, from Emeril's New New Orleans Cooking, his first book which was published in 1993, to Emeril's Delmonico, published in 2005. Emeril briefly starred in a self-titled TV sitcom on NBC during the fall 2001 season, but it was canceled after a few episodes and widely panned by critics. Recently he has appeared in Crest toothpaste commercials yelling his trademark catch phrase, "BAM!!!". Emeril Lagasse also has a line of kitchen knives made by Wusthof and cookware made by All-Clad. He is also an accomplished drummer, having passed on a scholarship to the New England Conservatory of Music. In the animated television series Futurama, the recurring chef character Elzar is a parody of Lagasse (voiced by John DiMaggio), even frequently using slightly modified versions of Lagasse's trademark catchphrases "BAM!" and "kick it up a notch." Also, a parody of Emeril appeared in an early episode of Cartoon Network's What-a-Cartoon! episode, Kenny and the Chimp, saying "BAM! Look at that bacon sizzle!" as a homage to Emeril's love of pork fat. Emeril also appears, both in several clips from his TV show, and, at the end of the movie, in person in the 2006 remake of J.B. Priestley's Last Holiday starring Queen Latifah. A Daily Show episode jokingly argued that Emeril could have done more to help New Orleans recover from Hurricane Katrina and thus failed to "kick it up [enough] notch[es]". Emeril himself has been a primary spokesperson for Katrina relief efforts and agencies owing to his connection to the city. Lagasse calls his cuisine "New New Orleans". He describes it as using local (Louisiana) ingredients in new and different ways. It should be noted however that the styles of cuisine at Lagasse's nine restaurants vary a great deal. Tchop-Chop in Orlando is "Pan-Asian" while Delmonico Steakhouse at The Venetian in Las Vegas is a traditional steakhouse. Lagasse is in his restaurant's kitchens a good part of the year. He can be regularly seen at his flagship restaurant, Emeril's New Orleans, the most. He and other celebrity chefs (notably fellow Food Network hosts Mario Batali and Alton Brown) are considered responsible for getting the general public interested in "good" cooking again.